Since 1981, Market Mall Denture Clinic has offered complete denture care	to patients across the region. From fabricating custom nightguards to	whitening your teeth to their original lustre, our team is committed to	your smile in everything we do. We also offer a full range of denture	repairs to our patients. We know that prompt, personalized service is	critical to delivering denture repairs you can count on. Put our 30 years	of experience to work for you when you’re searching for denture	repairs in Calgary. 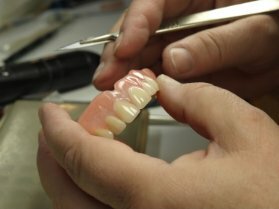 Even with great care and supervision, most people find their dentures need	professional repair at some point. Whether it’s a simple repair	or a more involved procedure such as a reline, denture repairs can be	a distraction. Using a brush with soft bristles – Using a brush with hard bristles can cause micro-abrasions on your dentures	and eventually wear them down, necessitating denture repairs earlier than expected. Avoiding biting on hard foods – Easier said than done! One of the most common causes of denture damage	is biting on hard foods like apples, nuts and candy. Pay attention to	what you’re eating to prevent denture repairs in Calgary. Handling your dentures above a soft	surface – Cleaning or handling your dentures above a soft surface can help cushion	the impact if you accidentally drop them, potentially preventing chips	and cracks in your dentures. Lay a hand towel over your sink our countertop	to help protect your dentures. Market Mall Denture Clinic is proud to offer denture relines in Calgary. As you and your dentures age, periodic relines are important to help them	retain their shape and grip, which in turn helps you speak, chew and smile	easily. Dentures that haven’t been realigned can gradually wear	against your soft tissue and bone, causing a host of issues. At Market Mall Denture Clinic, our goal is to ensure that your dentures	continually have a perfect fit. Our in-house lab allows us to make quick	work of denture relines, helping you return to your active, engaged life	as quickly as possible. No matter what your Calgary denture reline entails,	you can expect personalized service when you choose Market Mall Denture Clinic. If you need Calgary denture repairs, you want prompt and professional service. Market Mall Denture Clinic is proud to offer patient-focused care, always	committed to your health, comfort and satisfaction. For top quality denture	relines and total denture repairs choose Market Mall Denture Clinic. Call our Calgary denture clinic today to schedule Calgary denture repairs at (403) 247-6222.